We are a top-notch organization, engaged in providing Optical Tag. 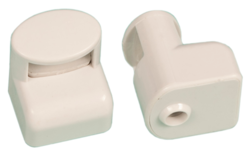 This is the new which we introduce, these tags are use in optical stores to stop pillferages. The optical tag is designed for sunglasses and glasses to be protected using a built in special locking mechanism to secure it around the frame. Available in beige with detection rate of up to 100cm on either side of the antenna. We are amongst the most reputed names in the industry, offering Optical Tags. Nice RetailBiz Technology Pvt. Ltd. This optical tag offers maximum protection for eyewear without interfering with the shopper experience. Placed on the side arm of the eyewear with the tag body on the outside, it allows customers to try on glasses without tag interference. Available in both AM and RF technology.